What is the Reggio Emilia approach curriculum? The Reggio Emilia approach is an educational philosophy focused on preschool and primary education. The program is based on the principles of respect, responsibility, and community through the exploration and discovery in a supportive and enriching environment based on the interests of the children through a self guided curriculum. Experiencing music through listening and participating provides a powerful means of expressing feelings, developing humor, and supports the learning of language. The child becomes aware of, and appreciates the richness of unfamiliar cultures and traditions. 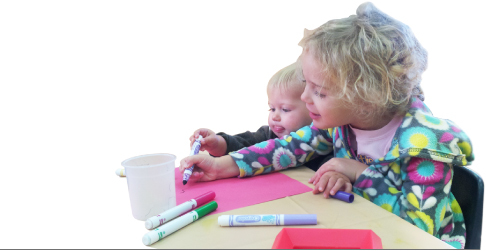 The visual arts in the early years involve picture-making. Printmaking, sculpting, and two-dimensional art works of art gives children and understanding of the elements of design. Dramatic play is a fundamental activity for all children. It provides a means for children to learn those lessons that “no one could teach them”. The child’s make-believe play is a reworking of bits and piece of experience to understand people and their actions. It is required for children to be provided with many meaningful occasions to talk and respond to language. Children recognize language not only as a means of communication directed towards them, but also between others. Socio-dramatic play offers the ideal conditions for the learning of language. It is never too early to familiarize with books. It is easier for children who are read to to learn how to read and write. Reading aloud in small groups offers involvement and enables the educator to teach children the notions of books. Picture-making is considered to be an important element in early writing. A child’s scribbles are a form of communication equivalent to the babble of early talk. Children’s early efforts at writing should be met with the same keenness as their earliest talk. The notion of number is acquired through many opportunities to count and compare. Making use of these opportunities inspires young children to expand their mathematical reasoning and learn the language they need to describe what they comprehend. Free play with a wide assortment of materials and toys is crucial. The preschool child uses instinct rather than logic, yet basically makes use of all the mental capability used by mature scientists during the process of inquiry. Inquiry is born of play and at any age, exploring materials and ideas, and relationships cultivate the capability to think. Technology is a vital part of the daily life of children. The approaches of technology involve inventing of transforming structures, systems, or processes using evaluation and testing. Block play incorporates the learning of mathematics, technology and science as children investigate.